We give lots of praise to The Dog Cancer Survival Guide because it’s such a great resource for anyone whose dog has just been diagnosed with canine cancer. And now you can win a free copy of your own. Read on for details. 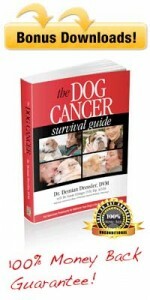 Many good books have been written about helping your dog fight cancer, but we feel that The Dog Cancer Survival Guide is the definitive resource for coping with this dreaded diagnosis. Whether you try the The Dog Cancer Survival Guide by itself or get even more help with The Dog Cancer Survival Kit, you’ll be informed and better prepared to cope with the road ahead. We can’t recommend it enough. 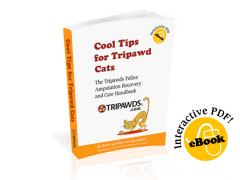 We have one free hard copy of the Dog Cancer Survival Guide and we’d like to give it to one lucky Tripawd pawrent. All we ask in return of the winner is that it gets re-posted in the Tripawds Angel Exchange when you don’t need it anymore. tell us about the #1 lesson you’ve learned about coping with dog cancer (so far). The deadline is Thursday, January 30 at 11:59pm Pacific time. One lucky winner will be chosen at random on the following day. 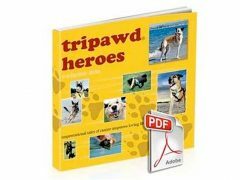 All entrants must be registered Tripawds Community members in order to qualify. I learned cancer is about quality of life over quantity of life. With all the drugs and chemo the most important is that the dog is happy. Thanks for taking time to enter Lief! Good luck! My dog is my inspiration. If we could all be as resilient as our dogs. There seems to be nothing he can’t conquer..even with cancer. Cuddle your pets while you can and never take them for granted. Dogs don’t know they are sick – they live in the moment and life is too short not to mimic the behavior of our four (or three) legged pals! In other words, be more like a dog! I have learned to enjoy every day with my greyhoundLucy. In the beginning I held my breath waiting for her to die. Slowly I could breath and treasure every day. She will have 28 months survival on 2/3/14. Ps she is doing great. To hear your pet has a diagnosis of Cancer is shocking…thank you for all the hours and hours of research you did. You have offered us hope that we didn’t have before. God bless you, hugs! Hi folks! We have a winner: Nancy Hood! Nancy, we’ll PM you for your contact info. Thanks so much everypawdy for entering. Stay tuned for more giveaways.